It was always entertaining watching the 90’s TV hit “Family Matters”, and nothing was more iconic in this show than the phrase that Steve Urkle said almost every episode. “Did I do that?” It was a light-hearted question that he would ask after making a careless mistake. Times have changed quite a bit since then. The dominance of the internet in today’s society is almost overwhelming. More so, according to Lenhart (2015) more than nine out of ten kids are online daily and of those one quarter consider themselves to be online almost all of the time. This can be contributed to the introduction of social media. It is because of these constantly evolving social outlets, and the desire of today’s society for instant gratification, that we find ourselves in danger without even realizing it. themselves or others to see what information is out on the web and readily available. Thankfully, we have many tech savvy students that not only enjoy doing this type of digital detective work but can often find even more than is expected. This leaves you wondering, if the students research themselves and are aware does this make them safer online? Well the answer to that is both yes and no. The reality is many students, and adults as well, make these simple mistakes online because they feel they are protected by the magic of the glowing screen in front of them. 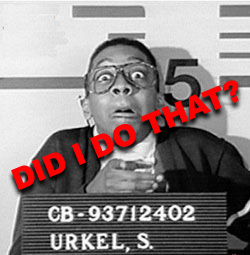 What they see as an innocent mistake, where Urkle would udder his phrase, can quickly get out of hand when observed by someone else. We have all heard the stories of someone in the corporate world that posted something they believed was innocent, only to learn that this had no compromised their job. We also find that many gain a sense of safety due to the fact that they are on the other side of the screen. These “keyboard warriors” may go online to specifically say something to get a reaction from a group that they would not normally say directly to someone else. It is due to this perception of safety that we find our society speaking first and asking questions second. This is also the reason that so many companies now have social media managers, that work along side their brand managers. I was recently at an advertising agency in the DFW area and was surprised to learn how large their team of social media experts was. I was even more surprised by the fact that their sole job was to watch developing trends on social media and react to them, or to create viral campaigns. While the job of a social media manager is one positive side of the access we have online, we must ensure that educators constantly model the best behavior for our students. Doing this, in conjunction with speaking to the students, will help ensure that our future leaders are aware of the digital footprint they are leaving behind, and will become productive members of the digital community. ← Digital Citizenship. What does it even mean? Did Google Images just rock your world? Susana Tablada on What’s the best deal on a computer?